Today’s AM fix was USD 1,314.50, EUR 952.74 and GBP 794.98 per ounce. Yesterday’s AM fix was USD 1,314.75, EUR 951.82 and GBP 796.87 per ounce. Gold climbed $2.30 or 0.18% yesterday to $1,311.80/oz. Silver rose $0.02 or 0.1% at $20.00/oz. Gold traded above a five week low today as investors weighed the crisis over Ukraine. Gold reached a six-month high on March 17th near $1,400/oz as brinkmanship and tensions between Russia and the West intensified and the worst geo-political crisis since the Cold War escalated. Yesterday U.S. President Barack Obama warned Russian President Vladimir Putin that Russia would face more sanctions if it moved further into eastern Ukraine after its annexation of Crimea. Worryingly for residents of New York and for financial markets, Obama also warned that he was more worried about the risk of a nuclear bomb going off in Manhattan then he was about Russia. Geopolitical risk in the form of terrorism, financial and economic war and actual war remains high and should support gold. Turkey’s gold holdings rose 9.292 tonnes to 497.869 tonnes, the data showed. Many analysts are ignoring the important context of today’s new geopolitical backdrop. Russia alone has some $400 billion in foreign exchange reserves – mostly in U.S. dollars. If they were to diversify just 5%, worth some $20 billion, of those reserves into gold – it would be equal to nearly 500 tonnes of gold or nearly 25% of global annual production. 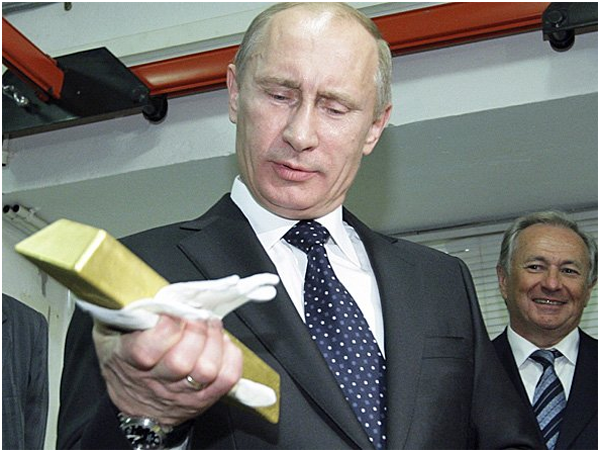 Russia bought another 7.247 tonnes of gold in February. It will be interesting to see what Russian demand is in March and indeed in the coming months. Sanctions could lead to materially higher demand from the Russian central bank, Bank Rossii. This would cause a material strain on the already fragile supply demand dynamics of the physical gold market. The possibility of a default on the COMEX gold exchange would become more likely, with a consequent surge in the cost of gold coins and bars and a difficulty of securing physical gold either in allocated gold accounts or for delivery. Hong Kong’s net gold exports to China jumped 25% in February after a small drop in the previous month, data showed overnight. Net gold exports to China from Hong Kong rose to 112.31 tonnes from 89.75 tonnes in January. Total gold exports rose to 125 tonnes in February from 102.64 tonnes in the previous month. China imported about 1,158.16 tonnes from Hong Kong alone in 2013, more than double its 557.48 tonnes in 2012, according to data from the Hong Kong government. China, the world’s biggest gold buyer, does not publish trade data for gold and there is the possibility that demand was even higher.Official sector demand from the People’s Bank of China is not declared and is not reflected in these figures. Nor are direct imports into other cities such as Shanghai from gold producing nations and countries that have seen rising gold exports in recent months such as the UK and Switzerland. This has been due to large London good delivery bars (400 oz) being shipped to Switzerland from bullion banks in London to be refined and cast into smaller kilo bars for the Chinese and Asian market. 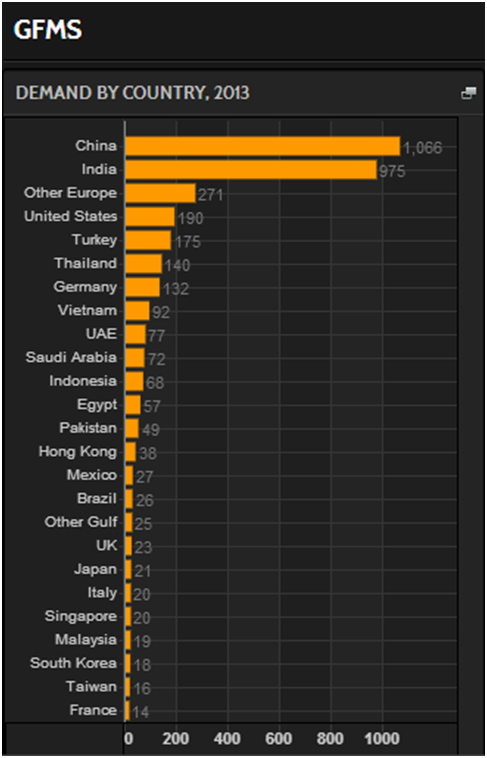 The numbers from Hong Kong, a main conduit for gold into China, give an indication of Chinese demand for gold but should not be relied on solely as there is clandestine importation of gold into China in recent months and years. The People’s Bank of China is widely believed to have engineered a sudden and sharp fall in the yuan in recent weeks to punish speculators who have seen the currency as a one way appreciation bet. The yuan gained some 30% since 2005. Thus, Chinese retail buyers have pulled back and demand has fallen in the short term. However, it is important to realise that there is more to Chinese demand than the so called “Chinese aunties”. Ignore noise regarding fluctuations in short term demand for gold and focus on the big picture quarterly and annual Chinese gold demand data which we believe will continue to be very positive. This is especially the case given the increasing risks emanating from the Chinese shadow banking system, the Chinese property market and indeed the Chinese banking system with localised bank runs being seen in recent days. The financial and economic system remains vulnerable with much unappreciated technological , systemic and geo-political risk. Owning non digital, physical bullion coins and bars in segregated, allocated accounts in Switzerland, Hong Kong and Singapore are some of the safest ways to own precious metals. Protect and grow your wealth by reading The Essential Guide To Storing Gold In Singapore.